When you open an OS map of Kilmartin Glen in Argyll, you’re tempted to think that you’ve stepped back into the Bronze Age. The area is simply littered with prehistoric sites: chambered cairns, hill forts, stone circles and cup-and-ring-marked rocks jostle for prominence in fields and on hillsides, outnumbering modern place names and presenting an almost too tantalising choice of which to visit first. 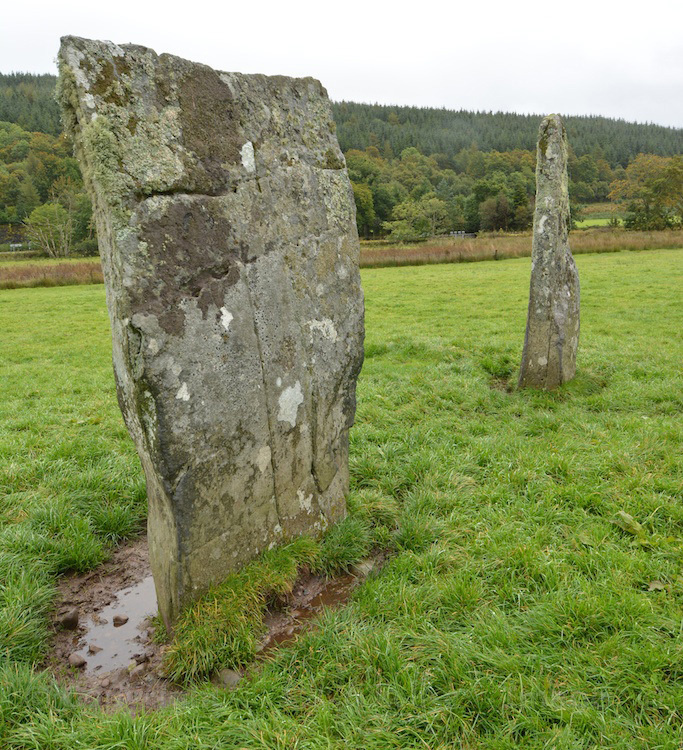 Why is there such a concentration of these sites in Kilmartin Glen? Archaeologists aren’t really sure, but the fact that this region has been in continuous occupation for many thousands of years suggests that its features – whether seen or unseen – held great significance for both the living and the dead. To present a complete and detailed picture of the entire landscape would take many years of visiting and research, but I’ve got to start somewhere… so where better than this intriguing arrangement of standing stones at Nether Largie. Nether Largie stands a couple of hundred yards to the right of the B8025, which leads from Kilmartin to Tayvallich. In fact, it is neither a circle nor a row, but when viewed from above (this will have to be in your imagination!) it resembles a very long and narrow rectangle formed by two pairs of stones, aligned on an axis that runs north-east to south-west, with a fifth stone in the middle. All five stones are either just over, or just under, nine feet in height. A sixth stone stands 100 metres to the north, but this is considered an outlier rather than an integral part of the group. The central stone dominates an arrangement of five or six smaller boulders that (because of their size) can’t really be called standing stones but would perhaps better qualify as squatting or sitting ones. 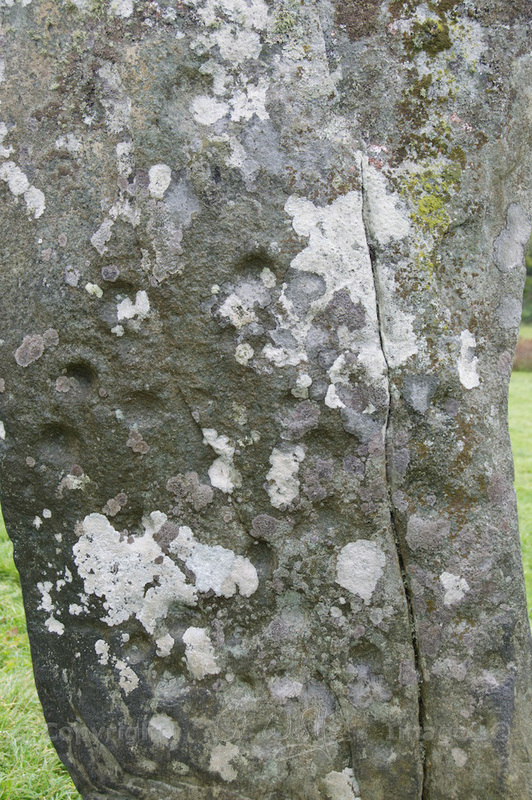 It’s impossible to tell what the central stone would have looked like, all those thousands of years ago. Over the millennia it has been fractured and weathered to a sliver, so that one edge resembles a knife blade, and colonies of lichen are enjoying penthouse accommodation on its upper levels. What is more interesting is that it is marked with an apparently random pattern of small cup-shaped indentations; these are undoubtedly man-made, but their purpose is still eluding archaeologists and scientists alike. 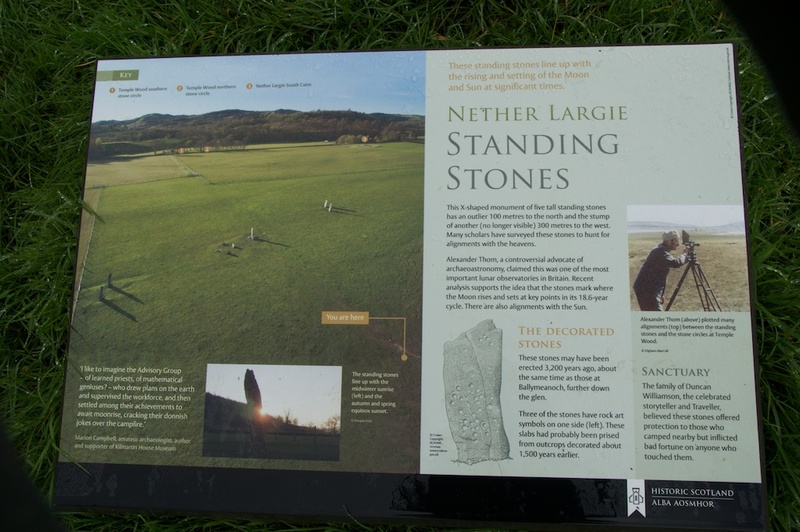 Alexander Thom, the celebrated historian and student of stones, visited Nether Largie in 1970 and claimed that it was among the most important sites in Britain in terms of its astronomical alignment. He believed it was a lunar observatory, designed to predict an eclipse. Thom was among the first of his kind to put forward such a radical idea, and at the time his theories were met with polite scepticism. But he was a true visionary. It has also been suggested that, although Nether Largie was ‘built’ around 3,200 years ago, the carvings on the central stone may have been made 1,500 years previously, when the stone formed part of the bedrock of another, as yet unidentified site; a block containing the rings was subsequently hewn out of this rock and transported to Nether Largie. This is an interesting idea but it sounds like a lot of hard work – and I’m willing to bet that the ancient inhabitants of this glen felt the same way, if the proposal was put to them! And what do the perplexing little potholes actually signify? Are they a map of the sky, or part of it? 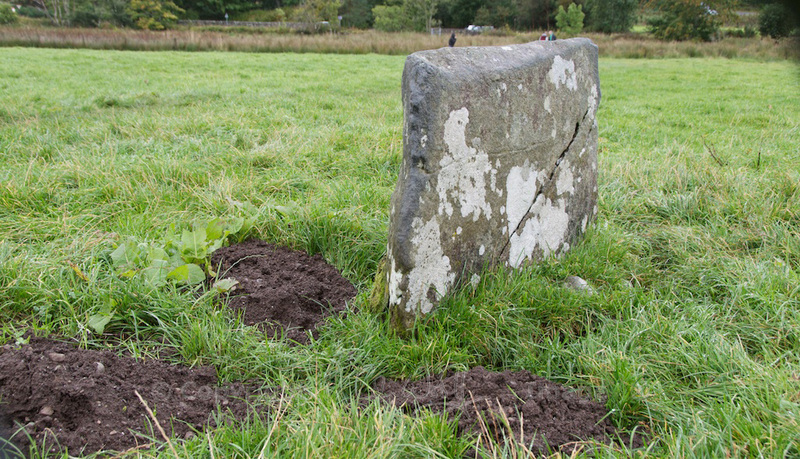 Do they mark a point where the moon appears to be swallowed by the stone – or emerge from it? What’s for certain is that our ancestors were compelled to spend their days and nights getting their positions absolutely right – and afterwards, who knows what they did? If Nether Largie is sharing its inner secrets with the sheep, it’s unlikely that they’ll agree to be interviewed. All we can do is walk between these silent stones, and wonder. Not far from Nether Largie lies the fascinating burial chamber of Dunchraigaig, and a few miles further north is the impressive standing stone at Kintraw, overlooking Loch Craignish. I’ll be adding more sites as soon as I can, so stay in touch! That’s such a shame, Ed. Such a great loss. I’m sure we have lost countless sites too, and many stones have been surreptitiously removed and used as gate posts over the centuries! Yes, the whole place is just fascinating. Never under-estimate the power of the sheep! 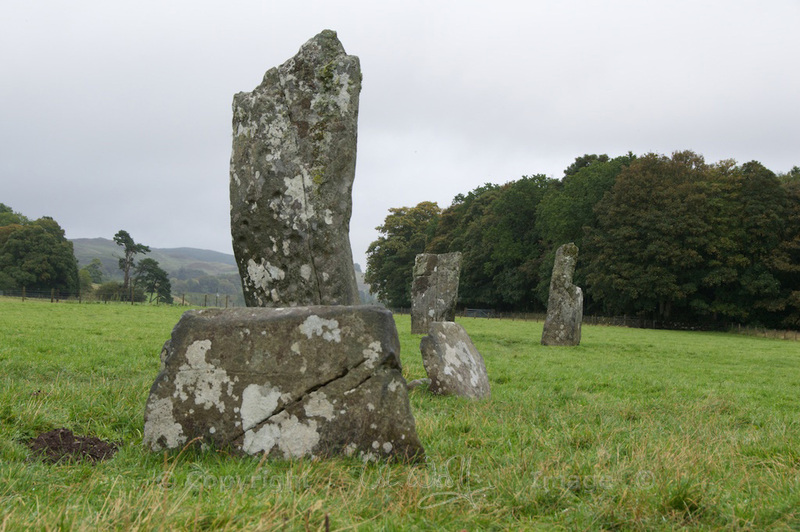 My mother in law, who is a real standing stone lover, is obsessed with Kilmartin Glen – now I can see why. It looks fascinating. Thanks for the great photos and text. You’re welcome, and thank you for the comment! 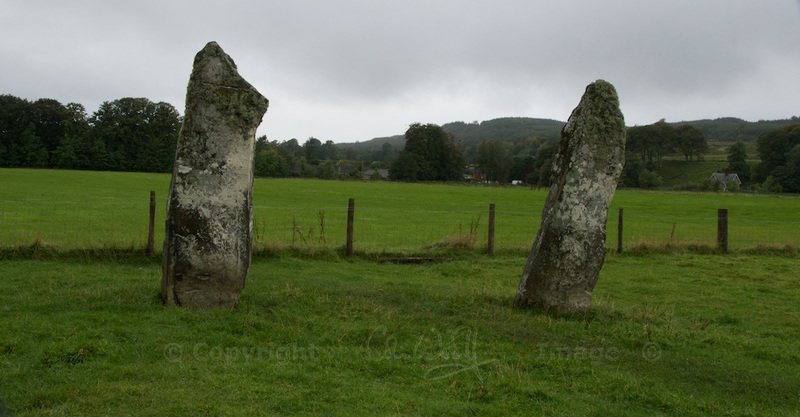 I really must investigate Kilmartin Glen more fully, and there is certainly a lot more to investigate! They fascinate me, too… glad you liked the photos! 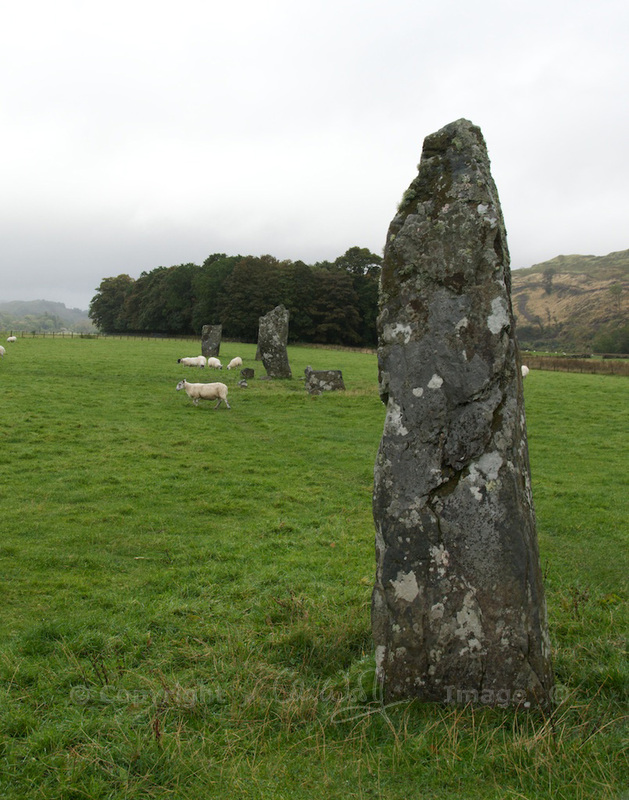 It really does make you wonder – I love sites like these, and I must go back to Kilmartin and visit some more. Thank you for your comment! Most curious, it makes you want to get into a tardis and go back to those days to find out. I thought my dad would be interested in this post so I forwarded it to him and he tells me that a friend of his is currently trekking round Scotland with a theodolite checking the measurements made by Alexander Thom. He’s going to alert him to your post. That’s an interesting project! Thank you for this. I would be interested to know if your Dad’s friend is going to publish his findings in a book or a website. I confess I tried to find Nether Largie via Google Maps to see an aerial view and came up lacking. 🙁 I will look into Kilmartin Glen further myself. Thank you for your generous post. I’m glad that you enjoyed it! Maybe it’s just too mystical a place for Google Maps! May I pick your brain about this place? Ask away – I am not an archaeologist, as you know, but I will do my best! I would also recommend the other websites that I mention under ‘Sources’. I’m more interested in the surrounding area. I got the impression from Gmaps that there’s a village nearby? Is this correct? 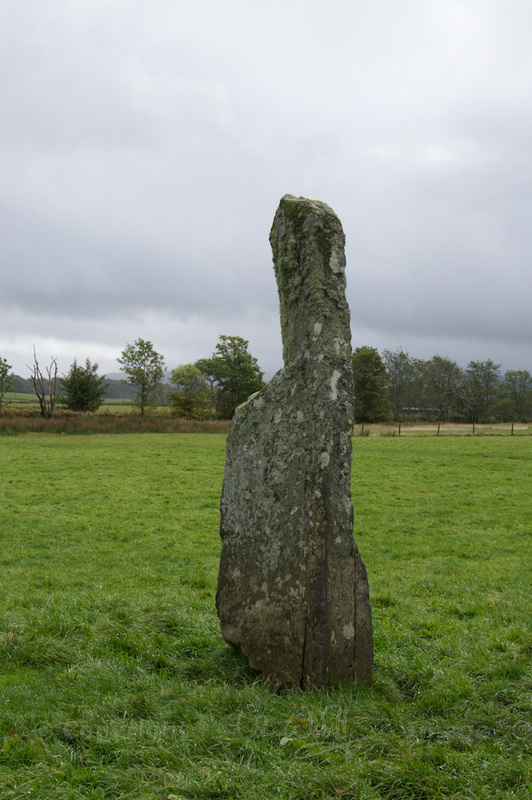 Yes, there’s a small village called Kilmartin – it has a shop, pub and a museum with information about the sites in the area. These places never did a lot for me in the past but I am starting to see there potential – challenge is how to shoot them to get people to connect in a2D way – mmmm one to ponder. Moonrise or sunset sounds like a good time to start! 🙂 I would love to see your photos. Thanks for sharing these lovely photos, Jo! Speaking of Cait Siths…the b/w image shown of the cnoc freiceadain chambered cairn in Caithness is awesome and rather spooky! You’re welcome, Hank! 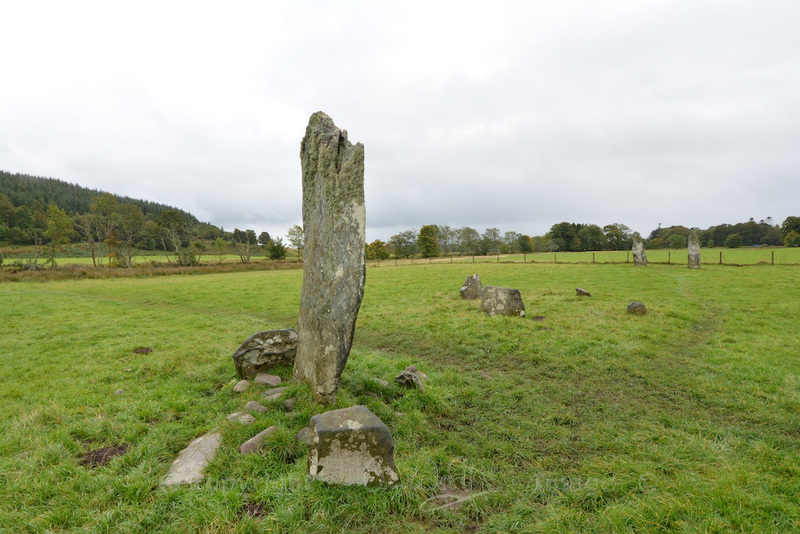 That is a very interesting post by the RCAHMS – and you’re right, the chambered cairn looks amazing in that photo! Thank you for the link. Another reason why I really want to visit Caithness! Incidentally I believe the ‘Caith’ in ‘Caithness’ is derived from ‘cait’ or ‘cat’, which is the same ‘cait’ in ‘cait sith’ (as in Purdey’s recent post!) ‘Caithness’ literally means ‘land of the cat people’. Yes! Yes! It is beautiful country up there, and marvelously interesting with its vivid Pictish/Norse history. It might be my favorite part of Scotland. Plus the possibility of wildcats! FYI, I think a long time after the Picts (the Catti so awed by the cats that they called themselves after them), Clan Sutherland made the cat-a-mountain their crest with motto: “Sans Peur”. The Chief of Clan Sutherland is “Morair Chat”, or Great Man of the Cats. …Methinks Purdey should do a little research trip and report back on Kellas Cats & company! How interesting! I didn’t know that, although I knew that some clans (e.g. MacPherson) have the motto ‘Touch not the cat but a glove’. I’ve always wanted to visit Caithness. We hope to go to Orkney at some stage, and perhaps do both at once.